Books, Books and more Cook Books! Those of you who know me on Twitter will know that I suffer from a ‘slight’ cookbook addiction and that cookbooks have a tendency to follow me home from shops! Surely a girl can never have too many shoes or cookbooks? 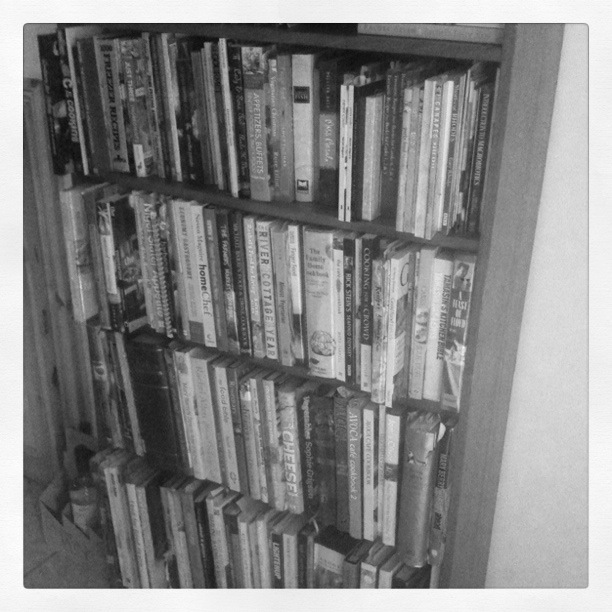 I have approximately 200 cookbooks (well 188 to be more precise!). I know this because due to recent house-painting they all had to be removed from the shelves so allow the painters near the walls and I took the opportunity to count them! The true number probably exceeds 200 as I found a few more today which had obviously been mis-filed! And then of course there’s the collection of booklets, food magazines, recipe files; not to mention the five lever arch folders from my time at Ballymaloe ( cookingisfun.ie)! So then I had an idea – why not use my cookbook collection as the basis for my blog (with a few other bits & bobs thrown in of course!) . All those books that are sitting there looking pretty will now have to pay their way! I’m challenging myself to work through them and try a recipe a week and give my tuppence worth on the book! Now I need to examine my collection carefully and select the first star………………Any requests?